In Australia in the last few years there has been a huge expansion of wind farms. Because they are a renewable resource with almost no emissions, they are being touted as the answer to all our prayers to reduce the speed global warming catches up with us. But are they? The total capacity so far in Australia is just over 800 mega watts, which is only a small percentage of the total power needed. Visually these huge structures have a colossal visual effect on the environment. They may be sleek and have good lines but so many of them pollute the landscape. 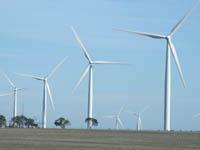 Unfortunately, these eyesores are located in some of the most picturesque country in Australia because of the availability of suitable wind. Wattle Point Wind Farm is the largest in Australia and generates 312,000 MWh of electricity per year, which is 2% of South Australia's total requirements or enough to power 52,000 homes. 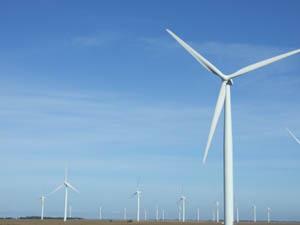 The farm has 55 turbines spread over 11.5 square kilometres of farmland. 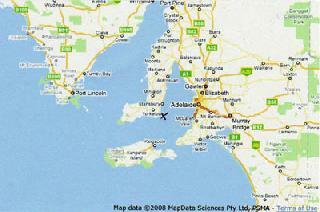 Located at the bottom of Yorke Peninsula (see map where the location is marked with an X) in an area of constant wind making the area ideal for generating power. The height of each tower is 67 metres and the length of each blade is 40 metres making the combined height 110 metres. Electricity generated by the farm is fed directly into Electranet's 132kV main transmission system and then onto the national electricity grid. So if Wattle Point produces 2% of South Australia's power on 11.5 square kilometres of land then that means it would require 575 square kilometres or 2,750 wind generators to produce the state's total power needs. To put that in perspective it amounts to almost 0.4% of the area of England - and bear in mind the population of South Australia is just in excess of one million. So if the population of England is fifty-two million it would need 143,000 wind generators spread over on area of 29,900 square kilometres or 22.93 percent of the area of the country - clearly not viable. 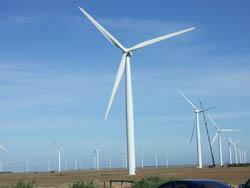 Wind power generation is only for countries that have large areas of land to spare. Although in the Wattle Point facility, it is mostly on farmland with an agreement that allows the farmer to farm the land after the generators have been built. Although the generators are fixed into the ground on large concrete slabs these are underground and backfilled leaving the only impediment to the farmer the circumference of the tower leaving plenty of land for the farmer. Wind Generation is only a part of the solution. Solar, hydro power, hot rocks, and many other alternative power sources with need to also supplement fossil fuel and nuclear power for a long time to come. In the meantime, a great deal of effort must be put into improving the technology to make alternative power generation more efficient.